I LOVE grilled cheese sandwiches. I love bread. I love cheese. What’s not to love?!? However, lately, I’ve had to adjust the ingredients a bit. So the bread is whole grain and the cheese is goat or sheep’s cheese. But you know what? You take bread and put cheese on it, it’s ALWAYS GOOD! I’m also a basic girl when it comes to my grilled cheese. Bread, cheese, some butter for grilling, and that’s it! No tomato, no ham, no avocado, etc. I remember the time we chased down the Grilled Cheese Truck in Los Angeles, a gourmet food truck that we’d been wanting to try. We finally caught it and the list was mainly all kinds of crazy stuff added to your grilled cheese. But I didn’t want any of that! I just wanted a delicious plain grilled cheese sandwich. So I guess I shouldn’t be surprised that the Food Network has a list of 50 Grilled Cheese Recipes. But I probably wouldn’t try any of them. Would you? 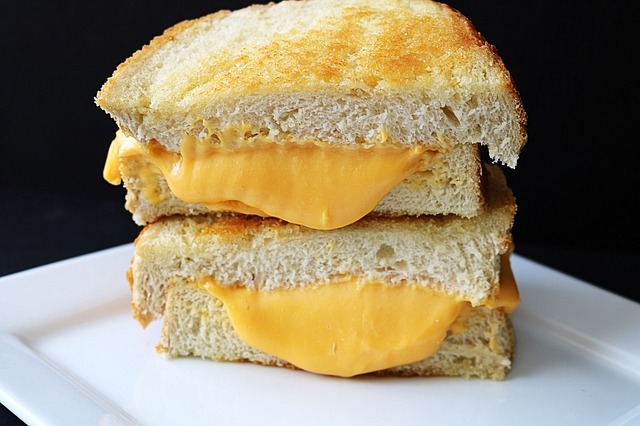 So if you don’t have plans already, maybe you should have grilled cheese for dinner tonight to CELEBRATE the day! Let me know if you do!